On this date in 205, the Roman patrician Gaius Fulvius Plautianus was put to summary execution for aspiring to the purple. 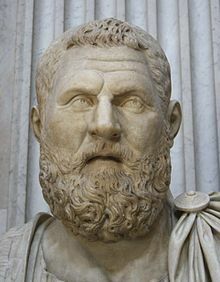 Maternal cousin and longtime ally to Septimius Severus, Plautianus had helped himself to a generous slice of power and wealth when his friend became emperor. He got his bristly mug onto imperial coinage and even dynastically married his daughter to Severus’s nasty son and heir* Caracalla. And so liberally did Plautianus wet his beak on the perquisites of this power that, Cassius Dio reports, “the populace in the Circus once exclaimed: ‘Why do you tremble? Why are you pale? You possess more than do the three. '” The three meant Severus himself and his two sons. Severus for a time blithely ignored his friend’s aggrandizement, and Plautianus made the political personal by appropriating for himself the estates of numerous senators whose proscription he helped Severus implement. But the enormous influence of his prefect soon began to present a threat that the emperor could not afford to ignore. In the coming years of the Third Century Crisis, this pattern would repeat itself with numbing regularity: the prestige of some figure would raise the prospect of his seizing the throne; the mere possibility would then thrust sovereign and potential usurper into a destructive mutual dash towards pre-emptive violence. The History of Rome podcast covers the reign of Severus and the fate of Plautianus in episode 101, “And All Was of Little Value”. * Co-heir, with his brother Geta — whom Caracalla murdered at the first opportunity after dear old dad died. † Caracalla had his former wife murdered in 212.